Nope, still not going there. Nathan caved first...I'm holding strong with my "alternative tastes of fall" binge for as long as possible! If you ever find yourself driving along Rt 100 in Waterbury, VT, chances are you'll stop for ice cream and maybe the tour at the Ben & Jerry's Factory. Been there probably 100 times on vacation, as my family vacationed in Vermont almost every summer for years. We still occasionally do. And dang it, we love ice cream. But there's much more to be had on that stretch of road. There's a Cabot cheese outlet annex store (oodles of free samples) and also Cold Hollow Cider Mill...with more free samples...and freshly made cider donuts to die for. 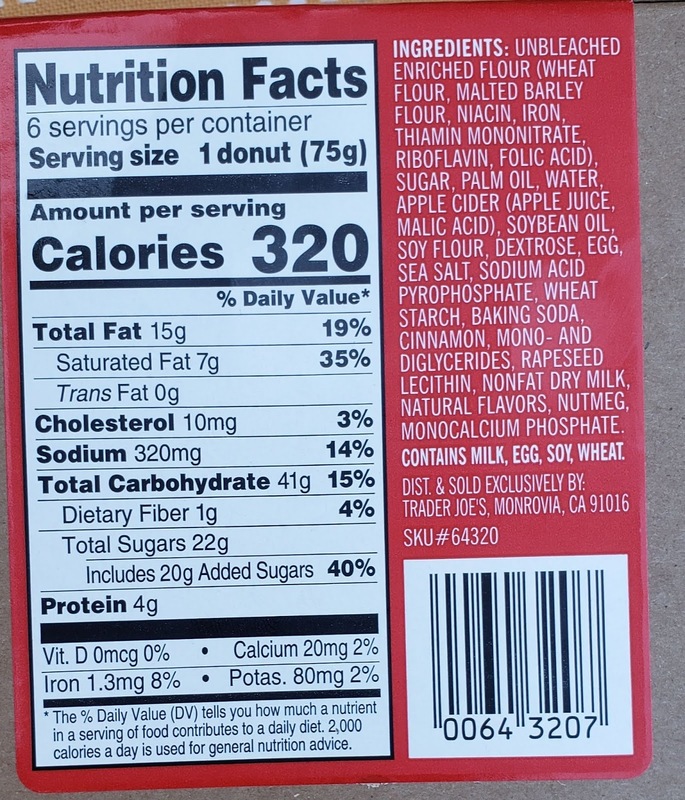 No, Trader Joe's Apple Cider Donuts don't hold up against Cold Hollow's, or probably any local apple orchard that makes their own cider donuts. There's just too much to be said for freshmade from a local source that make cider donuts an undeniable treat. 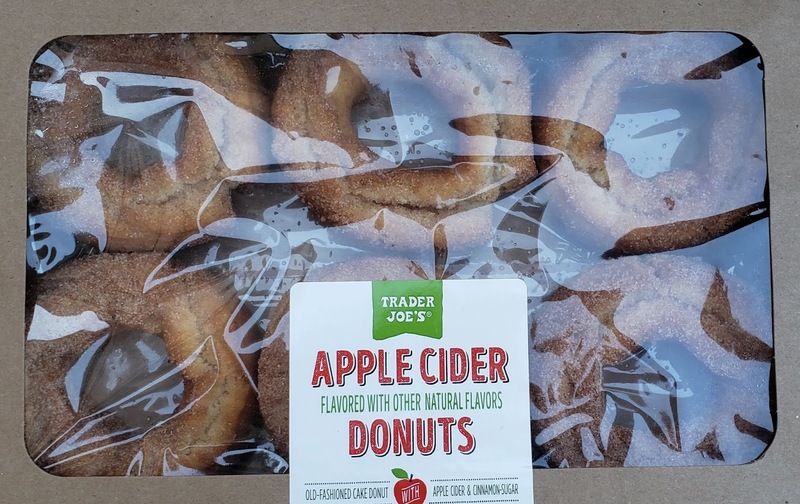 But if you're not anywhere close to anywhere that makes cider donuts and these TJ's ones are available, it's a more than adequate consolation prize. 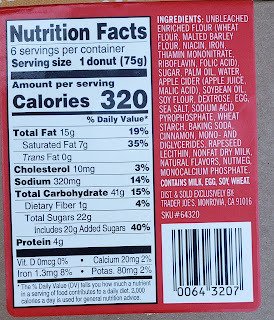 These cider donuts from TJ's are thick and dense and cakey. There's nothing light and airy about them at all. The distinct lack of overall greasiness to me that suggests perhaps they're baked and not fried. Biting into the dough past the cinnamon and sugar sprinkled outside, there's subtle appley sweetness with a little twinge of typical cider spices like nutmeg and clove. 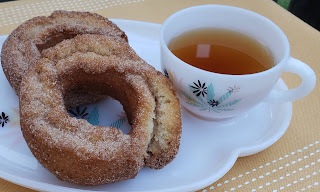 Admittedly, tthese particular cider donuts, as with most, aren't an overwhelming flavor experience, but go more for a comfort vibe. Eating one of these is good enough to hold me over for several hours, which is no easy task, and certainly not something an average donut could do. 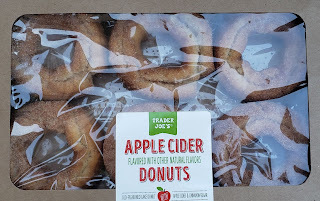 Still, having had truly exceptional cider donuts both on vacation in VT and closer to home from our local orchard, I can say these TJ's ones just lack a little something. I can't think of it being anything other than freshness and local taste. I'm not calling them stale tasting, by any means, because they're not, but a donut made moments before consumption tastes much different than one that's been in a box for at least a day or two. If you have no other options, go get 'em, you won't regret 'em. At $3.99 for the six pack, it's a good deal. I was happy enough to eat them alongside some coffee for breakfast the other morning, as well as enjoy part of one for a late night snack with a little bourbon. Our kids liked them but weren't wowed....just wait til I take them on vacation and stuff them full of free samples, donuts and ice cream right before they pass out for the long drive back home from Vermont, just like my dad used to do. Then they'll love cider donuts for sure. You could do bread pudding style with these. They’re definitely fried with the 15g fat, baked ones would be closer to 5g. I didn’t grow up with cider doughnuts, they just weren’t a “thing”. Probably because CA seems to grow about everything yet doesn’t have extensive apple orchards. I seem to try these once a year and the only version I really enjoyed was still warm. Thanks for postponing schmumpkindation for as long as possible, i have a very limited tolerance for the genre! I love Cold Hollow Cider Mill! My husband and I live in NH and we always go up there in the fall. We are spoiled with knowing what great cider donuts taste like :) Think this will be a pass for us, but thanks for the review.